Franco Ambrosetti was born in Lugano, Switzerland, on December 10th, 1941. He made his professional debut in Rome in 1961 with the quintet of Romano Mussolini, a leading Italian pianist. A year later, he enrolled at University of Zurich, then moved to Basel where he eventually earned a master degree in Economics. During this time, he also worked as a professional musician, leading his own groups mainly in Zurich and Milan, while also being a member of this father’s quintet. Between 1962 and 1966 he played in nearly all European Festivals – Comblain la Tour, S. Remo, Pori, Warsaw, Prag, Stockholm, Zurich, Lugano, Milano, Paris, Bologna etc – and recorded two albums as a leader and soloist. During this time he also worked with musicians such as Gato Barbieri, Daniel Humair, George Gruntz, Kenny Clarke, George Joyner, Pierre Favre, Dexter Gordon, Johnny Griffin, Benny Golson, Woody Shaw, Louis Hayes, Sam Jones, Donald Bird and many others. In Milan (Italy) he had opportunity to play in many jazz clubs like Intra’s Derby Club, a landmark that gave birth to most of the cabarets artists of our time. Jazz was an important part of the program which gave him the opportunity to meet and play with leading Italian musicians like Franco Cerri, Enrico Intra, Giorgio Azzolini, Franco D’Andrea, Dino Piana, Gianni Basso, Oscar Valdambrini, Renato Sellani, Enzo Jannacci etc. In 1966 he won the 1st prize for trumpet at the Vienna International Jazz Competition directed by Friedrich Gulda, one of the most important classic and jazz musicians of the last century. The jury was composed by Cannonball Adderley, Art Farmer, Jay Jay Johnson, Joe Zawinul, Ron Carter and Mel Lewis. Nearly 500 musician from all over the world took part to the competition, including Miroslav Vitous, Eddie Daniels, Fritz Pauer, Randy Brecker, Claudio Roditi, Jan Hammer, Joachim Kuehn, George Mraz etc. The international media coverage and the incredible following of the event suddenly lifted Franco Ambrosetti among the top European players, thus opening the doors to an international career. 1967 was his debut in U.S.A. where he is seen on the stage of the Monterey Jazz Festival with his father’s quintet and Jean-Luc Ponty. In the 70s he focused on his quartet, playing with other Swiss musicians such as George Gruntz (p), Daniel Humair (dr) and several bass players among whom Ron Mathewson, J. F. Jenny Clarke or Henry Texier. He also continued leading other groups (The Swiss Leaders) both in Switzerland and Italy. During this time he performed as a leader or special guest in nearly all the main European festivals: the JazzFest in Berlin (with Arnie Lawrence in 1977 and with Michael Brecker and Hal Galper in 1978), the Montreux Jazz Festival (1970/1979), Umbria Jazz (1975), Camden Festival (1978) and many others. 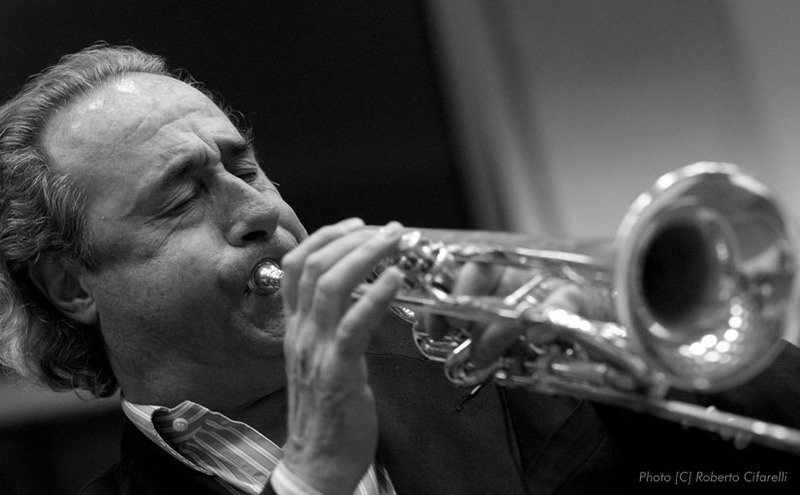 Franco Ambrosetti was a founding member of the George Gruntz Concert Jazz Band (formerly “The Band”) established in 1972, as well as associate musical director until 1985. He participated to several European and American tours and still enthusiastically collaborates with the project up to this day. 1974 he carried out a special project with George Gruntz by recording Trumpet Machine, an LP released by MPS with Woody Shaw, Jon Faddis, Palle Mikkelborg, Kenny Wheeler, Mike Zwerin and others. 1979 was a lucky year, as Franco Ambrosetti joined ENJA, a leading international record company located in Germany, with which has exclusively recorded ever since. After a successful first album Close Encounter, Franco released 14 more albums with ENJA. During the 80s an 90s, he successfully continued his activity, participating in countless TV shows, radio programs and festivals, recording most of his projects in NYC. During this time he also performed as a leader with different bands in NYC’s jazz clubs Blue Note, Visiones, Sweet Basil, Bradleys, Birdland among others and playing with musicians like Kenny Barron, Dado Moroni, Marvin Smitty Smith,Victor Lewis, Uri Caine, Seamus Blake, David Sanchez, Ira Coleman, Gary Bartz, Peter Washington and many more. In 1991 he performed at the Gala evening celebrating the 700 years of the Swiss Confederation with his group featuring John Scofield and Jerry Bergonzi. Continuing his recording activity, he released his new albums Light Breeze, Grazie Italia, European Legacy, Liquid Gardens and others. His son Gianluca, soprano saxophonist, often joined Franco’s bands and recording projects, indeed making the Ambrosetti’s the only family counting three generations of active jazz musicians! Since 2004 he has steadily collaborated with bassist Miroslav Vitous, performing in duo, trio or quartet as special guest. The music is highly innovative, as shown in Vitous’s Remembering Weather Report (ECM). Among the latest highlights, it is worth mentioning his presence as a soloist to the Montreux Jazz Festival Gala Night celebrating Quincy Jones’ 75th Birthday. Today, Franco Ambrosetti regularly performs with George Gruntz, Dado Moroni, Antonio Farao’, Enrico Intra and frequently teams up with Uri Caine’s trio,or in duo as well as with symphonic orchestras. Also worth mentioning, is his 25 yearlong collaboration with MINA, leading Italian singer and true icon of Italian music,and her son Massimiliano Pani. Franco recorded 26 albums as a leader, performing next to outstanding musicians such as Michael Brecker, John Scofield, Geri Allen, Phil Woods, Hal Galper, Tommy Flanagan, Howard Johnson, Greg Osby, Steve Coleman, Gato Barbieri, Dave Holland, John Abercrombie, Miroslav Vitous, Billy Hart, Mike Richmond, Don Sebesky, Eddie Daniels, Ron Carter, Buster Williams, Grady Tate, Kenny Barron, Viktor Lewis, Billy Drummond, Uri Caine, Clarence Penn, Drew Grass and, of course, his friends Gruntz and Humair. He is featured as a special guest in over 50 albums.